Celia and the Fairies by Karen McQuestion. Review: Have you ever been told stories, but cannot decide if they are true? In Celia and the Fairies , by Karen McQuestion, for Celia it's a whole different story, when her grandmother tells her stories about fairies from the Watchful Woods behind their house that she met at her age. Some of the amazing characters in this book include Mira, a fairy her grandmother saved from a shadow thing disguise as a coyote one day when she was Celia's age, Celia's bossy friend and neighbor, Paul, and his mean Aunt Vicky, owner of McClutchy Toys, which is trying to buy Celia's dad's toy company, Lovejoy World. 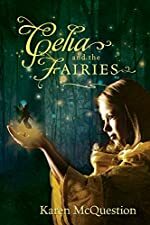 After, Celia hears her grandmother's stories, she sees the mysterious lights supposedly of the fairies and has dreams of Mira, exactly as her grandmother has described, telling her, "Vicky McClutchy must be dealt with, do you hear me? She's up to some evil, and you're the only one who can stop her, Celia." She is told to bring the flute out to the triple trees during the day where she will get further explanations. When she tells her grandmother, her grandmother shows her where she has hidden the magical flute, given to her by the fairies, that will grant the user one wish as long as it is not against the three rules. But for some reason there is only half of it, and she has to get the other half back from none other than Vicky McClutchy. Will Celia get the rest of the flute in time, and make the right wish to stop Vicky's evil plans? Celia and the Fairies is an amazing book for all fantasy readers. I loved especially the suspense that kept me interested all the way. For example, it is especially suspenseful when Celia not only has to find the rest of the flute but must find a way to save her house. I also liked the detail the author put into the story, like how Mira is described from Celia's grandmother's past, "I saw her clearly, her face just like a human girl's, her wings fluttering as quickly as a hummingbird's, her dress shimmering like silk," and later in Celia's dream, "A fairy girl, a dazzling beauty with luminous wings and a dress trimmed in ruby colored jewels, fluttered inches from her face." I think this book would be a good book for all fantasy lovers regardless of gender or age. In all, Celia and the Fairies is a great read for just about anyone who enjoys fantasy at any time and deserves 5 out of 5 stars. Review written by Matthew (6th grade student). We would like to thank Karen McQuestion for providing a copy of Celia and the Fairies for this review. Have you read Celia and the Fairies? How would you rate it?